According legend, Richard the Lionheart was returning from the Crusades in 1192 when he was shipwrecked in a storm, and cast aground on Lokrum Island in front of Dubrovnik. In order to thank God for his life, he vowed to build a great church on the spot where his life was saved. When he had layed-up his intentions to the shrewd Dubrovnik leaders, they convinced him it would be much better to build the church in Dubrovnik instead. That is how the legend tells the story of the errection of the Romanesque styled Cathedral in Dubrovnik in the 12th-14th century. This Romanesqu Cathedral crumbled to dust in the Great Earthquake of 1667. It was a luxurious domed basilica ornamented with many statues. In 1981, when the current Dubrovnik Cathedral underwent renovations, the experts were bedazzled to find out that another Cathedral was discovered under the foundations of the old Romanesque Cathedral. The architectural attributes back-dated that Cathedral to the 7th century Common Era giving new insights on the founding of the City. It was now clear that in 7th century Dubrovnik was a well built urban whole. The new findings later coroborated with the "new" theory of how Dubrovnik was founded and the whole puzzle fit in its proper place quite neatly. Before this discovery, the 7th Century was taken as the foundation of Dubrovnik. However, with that theory no one could explain how such a young city grew to be so strong in a rather short time. Now we know that at the place of what is today Dubrovnik a settlement teemed with life for generations, and the 7th century was a crucial turning point in the rapid development of that settlement as the Croat's settled the area to join forces with the indigeneous people of the area. 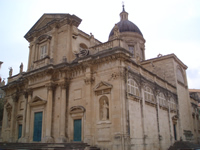 After the destruction of the Romanesque Cathedral in the earthquake, the Dubrovnik council wanted to rebuild the Cathedral as soon as possible. To help those endavours, Stjepan Gradić (then a custodian of the Vatican library, and later its Rector), A Dubrovnik patriot, recommended architect Andrea Buffalini from Urbino to the City council to realize the idea to build the Dubrovnik Cathedral in the Roman-Baroque style. Buffalini had made his designs envisioning the Cathedral as a domed three-nave church and presented them to the council for approval. 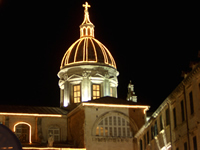 Today Dubrovnik Cathedral (Cathedral of Annunciation of St. Mary) stands as a witness of that approval. The Cathedral was constructed by 1713. The Treasury of the Dubrovnik Cathedral contains 182 relics, gifts from different regents, relics of the head arm and leg of Dubrovnik patron St Blasius, sacral dishes from 13th to 18th century, large number of precious paintings. The treasury of Dubrovnik cathedral was one of the richest on the Adriatic coast, but it was badly damaged in the Great earthquake of 1667. The objects which were saved from the ruins testify to this day of great art treasures that the church in Dubrovnik had possessed. Among the most precious objects in the treasury are the reliquaries of the head, and the arm of the patron saint of Dubrovnik: St. Blasius. The reliquary of his head, in the form of the Byzantine imperial crown, is embellished with enameled medals and precious stones. It is an excellent example of the outstanding work of Dubrovnik gold-jewelers from 11th-12th century. The treasury also has a number of paintings of extraordinary value from the Romanesque-Byzantine icon of the Virgin with Child from the 13th century to the paintings by Padovanini, Palma il Giovane, Savoldo, Parmigianino, P. Bordone and others. An interesting detail testifies to the proverbial caution of the Dubrovnik citizenry from the days of the Dubrovnik Republic. In those times Treasury of the Cathedral was regarded as the property of the Republic, and access was possible only by use of three different keys: one key was kept by the archbishop, one by the cathedral rector, and one by the secretary of the Republic. In the Cathedral, a polyptich in the main apse might catch your fancy, and it would be no coincidence: The polyptich is the work of the famous painter Titian Vecelli and his workshop. The name of the work is "Annunciation of Mary" and it befits the Cathedral perfectly. However, originally the polyptich was ordered by the brotherhood of St Lazarus, which consisted mainly of commoners who got rich by trading the Balkans, for their brotherhood church of St. Lazarus on Ploce. 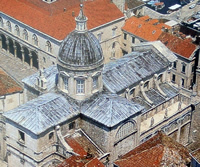 Towards the end of the building, Dubrovnik Cathedral was still missing its altar-piece, and in 1711 by the decision of Dubrovnik Senate it was decided to move the Titan's polyptich from the church of St. Lazarus that was also devastated in the earthquake to its current place in the Cathedral. The altar of St. John is made from purble marble in Nordic-Baroque style and is simply breathtaking. The altar was a donation of the Srijem bishop, Nikola Josip Gljivović from Peljecan peninsula, who was also an advisot to the Austrian monarch Marie-Therese. The votive altar of Our Lady of the Port has an interesting back story as the votive jewellery would be left to the Lady of the Port to keep the seamen safe out on sea. The seamen and their families commonly prayed at the altar. On the side of the altar you may see a collection of coral jewellery, a votive gifts to the Lady of the Port. The reason why the jewellery is coral lies in the fact that the Elaphite islands archipelago had been dived for corals and many fine coral jewellery was produced in the time od the Dubrovnik Republic. The Altar of "Petilovrijenci" is dedicated to three Montenegro martyr saints whose bones had been imported from Montenegro in Dubrovnik hunderds of years back. Originally their remains have been kept in the Church of Petilovrijenci but the church had been badly damaged in the Great Earthquake of 1667. The land where the church stood had been sold to one of Dubrovnik nobles who was conditioned to build an altar in the Cathedral for the martyr saints. The reason why these bones have been bought and imported from Montenegro in the first place, and also the reason why there are so many relics in the Treasury of the Cathedral, lies in the economy of the affair. In the past people traveled from afar to see the relics and be blessed by the divine that they believed dwelled in those relics. Therefore tourism of the past consisted of pilgrims who traveled from afar in search of the divine. More relics a particular city had, more pilgrims it would attract to visit. 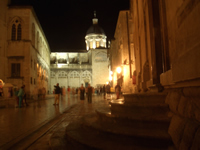 In the vicinity of the Dubrovnik Cathedral, on its western side, what is today Bunić Square, where the bars keep their summer terraces, used to be a polygonal Baptisery building made from red and white stone. This structure had been errected in 1326 and was the only part of the old Romanesque cathedral that survived the Great earthquake. Although it stood the test of time, in 1830 it was demolished on the order of one of the Austrian military commanders because it was obstructing the view from the window of his residency.